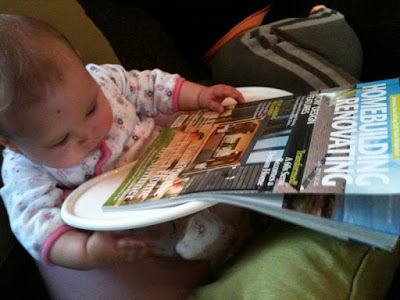 It looks like my 6 month old daugther Edie May is taking an early interest in my work….! 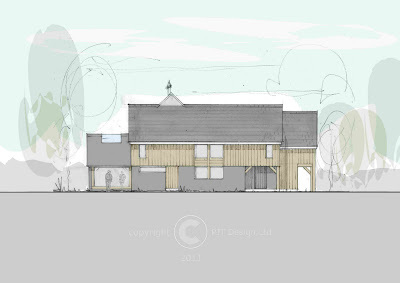 This is the job i am currently working on for a site of 2 new oak frame houses in conjunction with the Oakwrights team. We are planning on submitting the formal application by the end of August so i will keep you updated with any news. Just been working up the site plan today and all looking good. 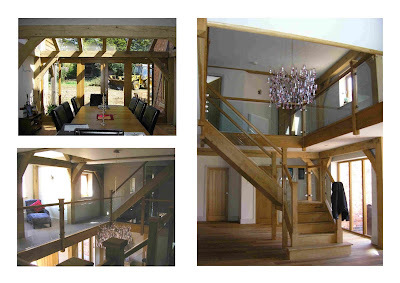 Here are some further advanced images from the barn i was designing last week for clients in Essex who want a contemporary barn. 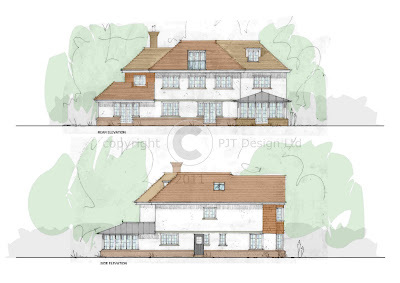 External finishes on this design are going to be large slate or granite tiles on the ground floor, vertical cedar boarding above and either a slate or zinc profiled roof. 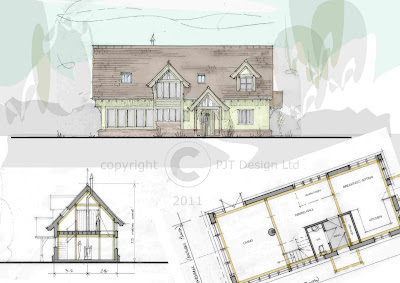 This is a house i designed and got planning for during 2009/2010. 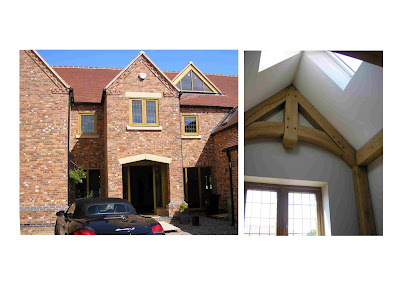 Its another project with T J Crump Oakwrights and although on the outside we had to keep things fairly simple and of the local brick/tile vernacular, it still works really well as an oak frame home. Have been working on this one for most of this week…. 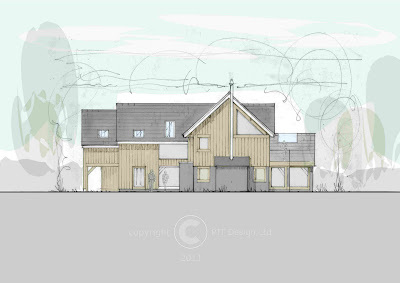 funky contemporary barn for some Essex clients…. These are quick shots straight off the drawing board so fairly sketchy quality but looking really good… should be finished up in the next day or two so will post up finals as soon as they are done. 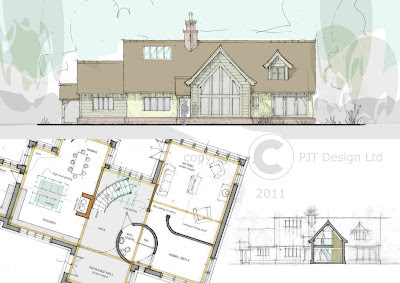 Seem to be working on loads of sloping site and split level designs at the moment…..! These involve a bit more “head-scratching” than normal but ultimately end up resulting in some exciting designs and spaces….. 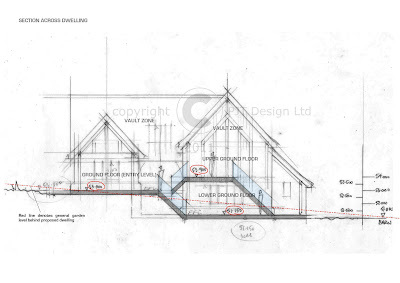 Here is a typical section through a split level design…. 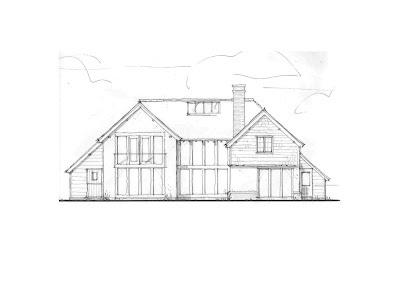 and this is the resulting external elevation…. This is for a site down near Farnham, Surrey…. once we have got the design sorted and into planning I will post up some more pictures. is bordered by a large lake and also a dense woodland of oak trees, so pretty special really. I am currently working through to pre-application stage with the clients who are now happy in principle with the designs. Once I have negotiated my way through the pre-app stage with the local authority and reached an agreement in principle, we can proceed to full application. I have designed the buildings as classic quirky random Suffolk vernacular with a subtle mix of locally referenced claddings and building shapes. The main house sits over a drop in levels on the site and therefore what appears to be a single storey building with attic rooms from the front, does in fact open up into 3 storeys at the rear.. 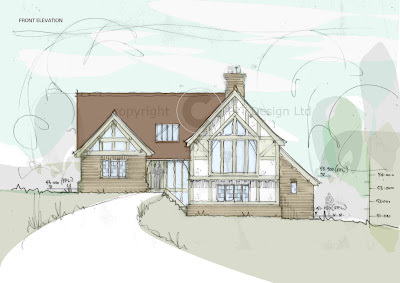 This is my next joint venture with an Ascot based developer that I have worked with for years now…. I will keep you updated with any news. 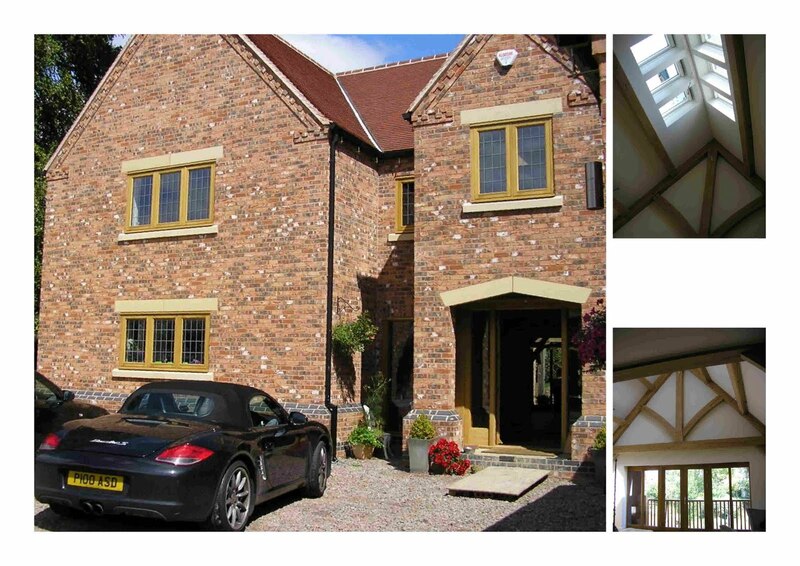 This is a really cool house i designed back in 2008/2009 and the clients have emailed me today with some photos of the nearly finished project…. looks absolutely spot on in my opinion. 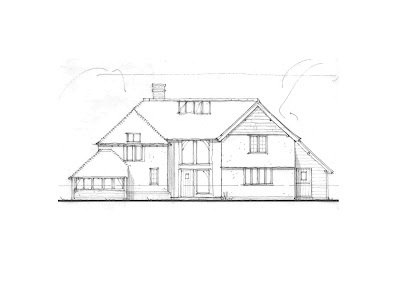 It was a tough planning scenario whereby i gained planning permission for the demolition of the current dwelling and replacement thereof with a full oak frame build in association with my friends at T J Crump Oakwrights…. It was tough in that the plot sits within the Green Belt where only very limited enlargement on replacement is permitted under current planning legislation. 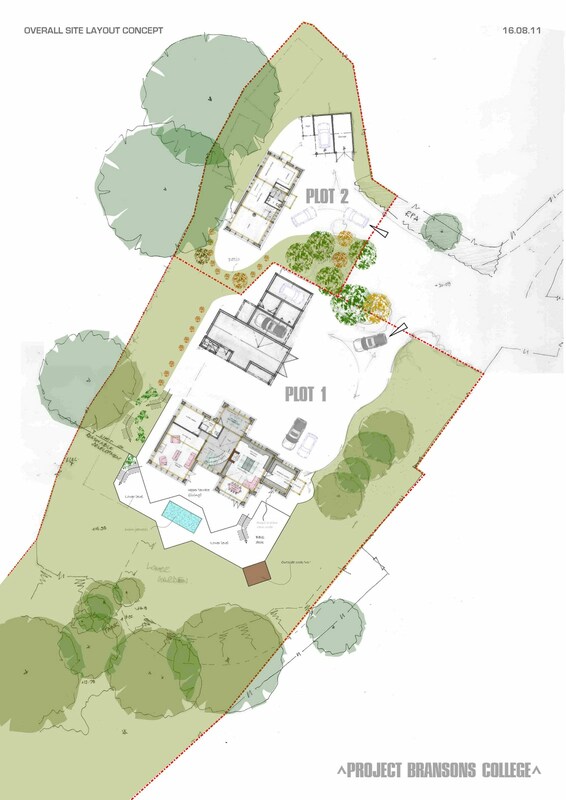 I worked closely with the planning officer and conservation officer at pre-application stage to ensure we worked up a design that they were happy with as well as my clients. Looks absolutely excellent though Simon and Vicky so many congratulations and enjoy your new home..!